» Why Does My Cat Knead Me But Not My Husband? Cat kneading is part of a cat’s natural behavior. The photo above is cute and although kneading bread is just an analogy, the way a cat kneads a person, is a very similar motion to kneading bread. Not long after birth, a kitten will place his paws against his Mother's mammary glands to stimulate milk flow. This is a perfectly reasonable explanation so why then, is this behavior carried on far beyond kitten-hood? How To Stop Kitty From Kneading In The Middle Of The Night? Yes, I know this feeling all too well and it also leads to the question, why did the cat always sleep tucked up against my pillow during the day but not my partners pillow? On my side again kitty! Why does the cat particularly like my flip flops (although as he has become older he is less discriminating with his shoe preference)? It probably isn’t the kneading action that is specific to you it is just the cats general behavior towards you. If you are the one who is primarily in charge of feeding the cat, that is a strong bond. It may not be just that however, sometimes cats just bond with one person more than another. When our cat developed diabetes, the feeding process changed totally. It had to become regimented time wise, in order to give the necessary insulin injections before the cat could eat. Now that we are both feeding the cat, the cat has developed a far stronger attachment to my partner then he had before. So essentially, your cat is choosing you. That’s fine, if it is okay with you but some people don’t like to be woken up by kitty deciding that 2 am is perfect kneading time. The kneading is usually accompanied by purring so it's a double whammy. However we also don’t want to be mean to kitty by getting cross with this him as all that he is saying is that you are his safe place. He isn't really thinking about disturbing your sleep. There are some things you can do to help adjust this behaviour that keeps everyone happy. You know I just love you! If it is really bothering you and disturbing your sleep quality, consider not allowing the cat in the bedroom at night. This is not always as easy as it sounds as a kitty can be pretty persistent with trying to get in. I won’t go quite so far as to say bashing down the door but it can sound like that in the middle of the night. You may have to employ your best detective skills to make sure that kitty is comfy and can't sneak to the bedroom door and launch a full on assault. Your cat is actually creating a nice soft spot to sleep when he is kneading in the same way that he may sleep on your discarded clothes. Your cat feels content because your smell is on the clothes and he in turn can leave his scent behind. Win win for kitty but not win win for you if this is happening in the wee small hours. Here are two ​suggestions. ​The same basic principle applies. Move kitty to a more acceptable space that has your scent and where he feels secure. How? Put a comfy pillow on a chair or somewhere that is near the bed and if kitty starts being problematic in the middle of the night relocate him to the pillow. Our kitty has a love of all things white, so there is a fair chance that a white comfy pillow will do the trick. I can’t say it was successful 100% of the time but some mornings I was surprised to see that he was still there. Have a soft fleece rug nearby, perhaps at the end of the bed and as soon as he starts kneading move him to the blanket. If the blanket or cushion/pillow is one that you use, it will already have your scent and kitty will like that. ​In cold weather consider a warmed heat pad underneath the bedding. ​You might also find these articles helpful regarding cat behavior. ​Why do cats start galloping around the house in the middle of the night? Cat behavior ​is somewhat of a mystery and even if you think you have finally figured some things out there will always be a new surprise to keep us on our toes. ​Pam Johnson-Bennett ​answers many commonly asked questions about cat behavior. This is a link to the most recent​ reviews of her book. 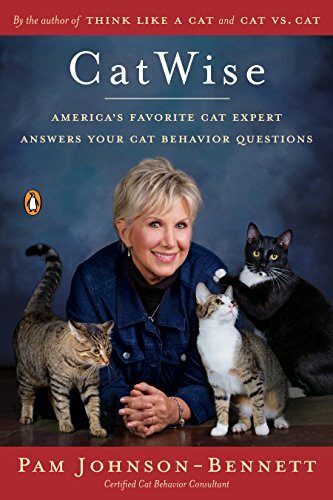 By the way, Pam has written several other books ​about cats also. Previous Post Why Do Cats Headbutt You When You Get Home? Next Post What Are The Reasons Cats Get The Cat Night Crazies?